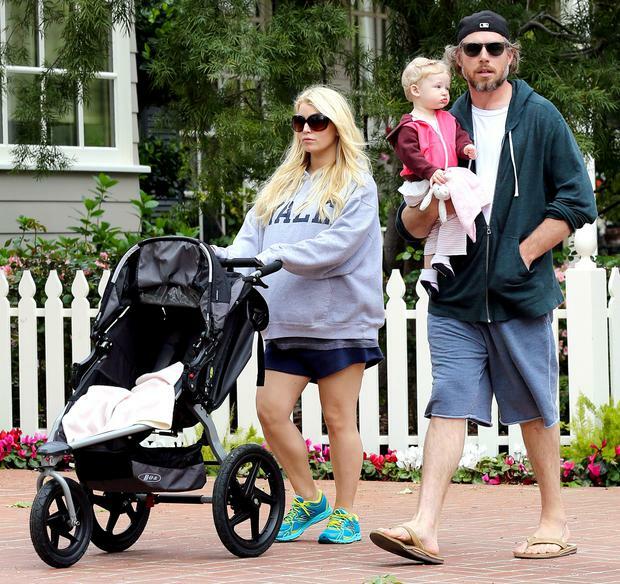 Jessica Simpson is reportedly set to get married over the July 4 weekend. The 33-year-old star has been engaged to her fiancé Eric Johnson since November 2010 and the couple have daughter Maxwell, two, and ten-month-old son Ace together. It was known they were planning to tie the knot this year, and now a source tells Us Weekly it will be over America's Independence Day weekend, also known as Fourth of July. While they were previously reported to be having the ceremony in Capri, Italy, Jessica and Eric are now said to have relocated the occasion to Santa Barbara, California. It is thought the couple decided it was "too much" to ask their friends and relatives to fly abroad. The bride-to-be is said to be going all out with her wedding dress. Rather than opting for a cliché white number, the singer-and-actress allegedly wants to make a statement that stands out from her previous nuptials to ex-husband Nick Lachey in 2002. "Jessica is having something unique made," the source added. "It will be very different from the Vera Wang she wore to wed Nick Lachey." Eric popped the question to Jessica after only five months of dating. The blonde beauty recently revealed she and the former NFL player had originally planned to walk down the aisle a lot sooner, but the birth of their children put things on hold. "We are very close to sending out our invites," she told USA Today earlier this month. "I've been very picky on how I want everything to look and feel. Eric's family alone is almost 90 people, so it'll definitely be a big event." It seems Jessica has found the perfect partner in Eric. She previously spoke of how her future husband helped get her back into shape and lift her spirits after her pregnancies. "With both kids, I'm running up and down my stairs a million times. Kids can keep your metabolism going. Eric and I go on walks together. I try and walk about four miles a day consistently. It makes me feel better," she smiled. "[Exercise helps] with all the hormones I have to deal with. Working out and being active overall makes me a happier person to be around. I let out so much more anxiety if I go out and walk and talk to Eric, who is basically my therapist on our walks."